Please note the venue change for this month’s meeting – we will be at Wynford Community Hall! Risinghall Street, behind Saint Silas church. We are delighted to welcome the Thrifty Stitcher to this month’s meeting – Claire-Louise Hardie. She will be talking about her “life in stitches”, including about her career as a professional stitcher, and a little about the Great British Sewing Bee! “The Thrifty Stitcher offers friendly sewing classes for aspiring DIY seamstresses and crafters. This small school in Stoke Newington is run by Claire-Louise Hardie. 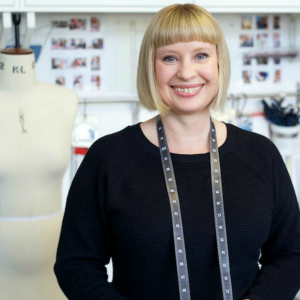 Originally trained as a Costume Designer at The Royal Welsh College of Music and Drama, Claire-Louise has worked in all aspects of Costume for Theatre, Film and TV. In 2009 Claire-Louise began teaching sewing in Stoke Newington and through her teaching has regained a love of dressmaking for herself. If you were at July’s meeting and made a mosaic coaster, you’ll be able to collect it at this meeting!